One of the best things about vinyl flooring is that it's very easy to clean. A quick sweep-up or vacuuming followed by a damp mopping takes care of most cleaning you'll ever need to do. When the vinyl gets stained or scuffed, or if you've neglected it for a long time, it will require some deeper cleaning, but even this is relatively easy. Vinyl also doesn't need any special cleaners, restorers or protective products, such as wax or polish. Modern "no-wax" vinyl flooring of all types is made to last for many years just as it is. Keep it clean with frequent sweeping and mopping and it will remain the same simple, low-maintenance material is was designed to be. Of all the cleaning you can do, regular sweeping or vacuuming will benefit your vinyl the most. This is because grit and loose dirt are your floor's worst enemies. Gritty material comes in on our shoes and is ground into the flooring as we walk, creating tiny pits and scratches in the surface. These little blemishes eventually dull and discolor the floor and ultimately destroy the protective wear layer of the vinyl. In short, the more often you sweep or vacuum, the longer your floor will last. Always use a hard-flooring attachment or setting when vacuuming vinyl floors. Once you've swept or sucked up the dirt, dust and grit from your vinyl, all it usually needs is a damp mopping with warm water. People often they need some kind of soap on a floor, but inexplicably, they tend to apply this rule only to hard flooring. Carpeting gets a soap treatment at most once a year when the carpet is professionally cleaned, yet people seem to think that vinyl flooring requires weekly soap. The fact is that most dirt and grime on vinyl comes up just fine with nothing more than warm water. Damp mopping vinyl means just that: damp. Before applying it to the floor, always wring out the mop to prevent excessive amounts of water or, worse, pooling water. Vinyl tiles and planks, which have numerous seams, can be damaged by excess water, as can the subflooring under the vinyl. The best type of mop for most vinyl is a sponge mop or a microfiber mop. If you want to add a cleaning agent to your mop water, add 1 cup of vinegar (white or apple cider) to 1 gallon of water. 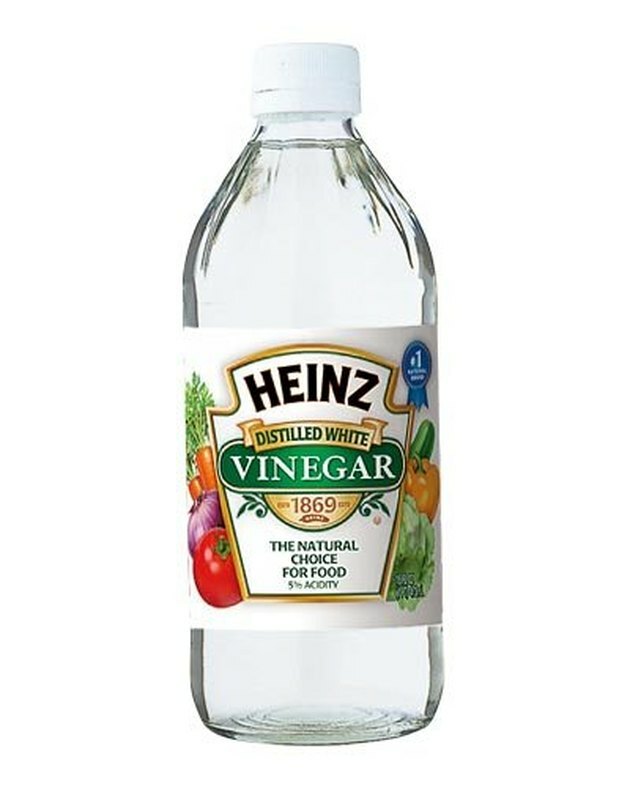 The mild acidity of vinegar adds a modest boost of cleaning power to water and has some (if very limited) disinfecting properties. It's also a good choice for vinyl because it's non-abrasive and won't damage the resilient surface, and it doesn't leave a soapy or oily residue, which only attracts dirt. You don't have to rinse after mopping with water and vinegar, but it doing so helps to remove the vinegar smell, if that bothers you. If you don't rinse, the smell dissipates soon after the floor dries and vinegar evaporates. Don't add scented oils or soaps to the mixture to help combat the odor, as these will just leave a residue. It's a cliche, but vinegar really is good for vinyl floors. In case you're wondering, there's nothing special about cleaning vinyl planks vs. tiles or sheet vinyl. All types of vinyl should be swept and mopped as needed, and the same cleaners work on all standard vinyl materials. If your floors have deep grooves, you can clean them with a nylon-bristle brush or an old toothbrush and wipe out the grooves with a slightly dampened sponge or a microfiber cloth. Most stains on vinyl come up with the right cleaning agent and a little elbow grease. If the staining substance is gummy or bulky, carefully scrape up the bulk of it with a putty knife or spatula before cleaning the stain. Hold the tool flat to the surface so as not to scratch or gouge the vinyl. Baking soda: You can try baking soda as a first attempt on almost any type of stain. It tends to work best on food stains. Mix it with a small amount of water to create a paste, and rub it into the stain with a circular motion, then rinse the area clean. Rubbing alcohol: Apply isopropyl alcohol to a cotton ball or paper towel and rub the stain, repeating as needed. Alcohol is a great adhesive remover and is effective on a wide variety of stains, including oil, grease, paint, tar/asphalt, wax, lipstick, hair dye, ink, crayon and some markers. Mineral spirits: Try mineral spirits for tough paint, marker, crayon, wax or tar stains that don't come up with rubbing alcohol. Apply as with rubbing alcohol. Bleach: Bleach can remove rust and embedded colors from food and cosmetic stains. Dilute bleach as directed for general cleaning and apply the solution to a clean white cloth. Place the cloth over the stain and let it sit for up to 1 hour, but no longer. Remove the cloth and rinse the area with a clean cloth and water. Standard off-the-shelf rubbing alcohol is a safe and effective stain remover. Vinyl lives up to its name "resilient" flooring, but it's nowhere near as tough as, say, ceramic tile. You can damage vinyl with harsh cleaners and chemicals and with abrasives of any kind, including abrasive cleansers and abrasive tools, like metal scrubbies and wire brushes. Many manufacturers and cleaning experts also warn against using steam cleaners on vinyl because the high heat can be damaging and the hot moisture can penetrate vinyl seams and possibly lift edges or cause warping. 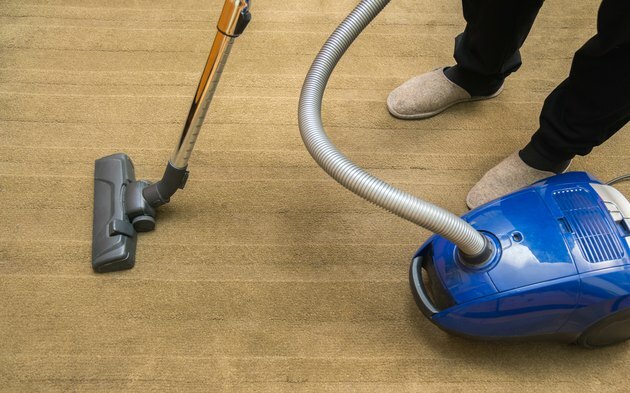 If your steam cleaner's literature says it's safe for use on vinyl, you'd be wise to double-check with the flooring manufacturer or retailer, especially if you have vinyl tiles or planks. Some people swear by acrylic finishes (such as Mop & Glo) for vinyl, just as some people like to use furniture polish or oil soap on wood. It's really up to you. The problem with finishes and polishes is that they build up on the surface and ultimately need to be stripped because the floor becomes dull and/or discolored. This usually requires a heavy-duty cleaner/stripper—preferably a product sold by the flooring's own manufacturer, just to be safe. In any case, the extra shine you get from a polish is temporary and, in the long run, makes more work for you.